From world-class skiing to a delightful snowshoe trek, opportunities to play in the snow are found throughout our side of Mt. Rainier National Park. The road into Mt. Rainier National Park closes at the junction of Crystal Mountain boulevard for the winter, and it is possible to cross-country ski into the Park. Alternatively, the surrounding national forest offers wonderful winter recreation opportunities. Read on for some of our favorite winter activities. More information can also be found on our sister site, StayCrystal.com . 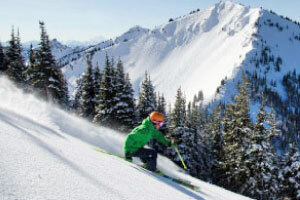 One of Washington’s premiere winter recreation areas, Crystal Mountain Resort is located at the northern boundary of Mt. Rainier National Park. With 2,600 acres of everything from gentle groomed runs for beginners to challenging steeps, glades, chutes, bowls and expansive backcountry for the more adventurous, choose your adventure. Crystal Mountain averages 486 inches of snowfall annually, with 3,100 vertical feet. Crystal boasts 11 lifts including a six passenger high speed lift, an 8 passenger gondola or the basic children’s surface lift, with quads, doubles and triples in between. For all the details, visit Crystal Mountain Resort. Venture through a winter wonderland and find yourself in the quiet, snow-laden forests, looking out upon craggy peaks and taking in superb wilderness views. The Crystal Mountain area offers a plethora of choices when it comes to snowshoeing and cross-country skiing. Find family friendly treks, those that offer a great workout, and even find guided tours at Crystal Mountain Resort. Here are a few ideas to get you started. The Pyramid Creek Motorized Sno-Park offers 68 miles of groomed trails. Located near Greenwater, it is open from dawn to dusk. A motorized sno-park pass is required. For current conditions, call the Snoqualmie Ranger District in Enumclaw at (360) 825-6585.